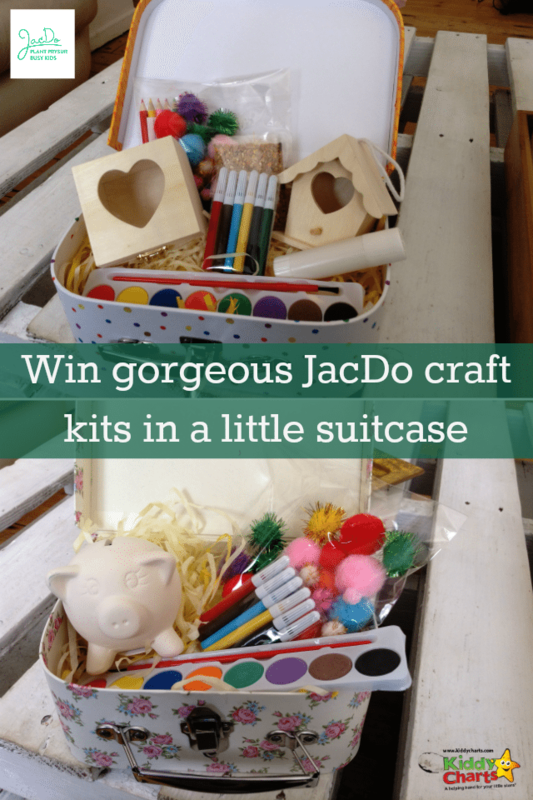 Our summer countdown continues with Day 7 today, and we are giving you some gorgeous craft kits from the wonderful JacDo, whose owl helps kids to learn, and have fun at the same time. We have taken a look at these products, and are to publish a review on them later this year. My daughter and son both love them. We have TWO to give away today on the blog, to add to the other great giveaways we have had over the last few days. Do check them out, and sign up to our summer countdown so you don’t miss any of them as they come out. JacDo has a selection of craft kits on the site, as well as subscription services to suit any crafty types, offering small to large packages, with the number of items to build from your box vary9ing from 3 up to 7 depending on how you feel. To enter to win one of two of their lovely kits, presented in a little suitcase, just fill out the widget below. This giveaway closes on Tuesday 11th August at 11.59pm, and as always on the site, our standard T&Cs apply for the giveaway as well. Only open to U.K. readers as usual. I love the Sew Your Own Owl Cushion and I also love the Colour Your Own Cozy Coasters – brilliant gift ideas. Fantastic #competition :-) Would love to win! The sew your own owl cushion is lovely. My Niece would really like it, she’s obsessed with “owlies” and has started to enjoy simple sewing recently. I love the Make Your Own Badges kit. It reminds me of when my Dad used to make badges for the charity he was fundraising for. Me & my sis helped him makes hundreds of badges. We like the treasure chest kit as once we have made it we can hide it with fun things in to find later or for other people!! I love the Sew Your Own Owl Cushion my daughter would really enjoy this! My daughter would love the colour your own fabric butterflies :) and I’d love it too! Piggy Bank Crafting Kit would encourage kids to save some money. Marbling Crafting Kit – This is a unique idea and marbling is something new that my daughter and I have never tried before. Piggy Bank Crafting Kit, looks cute and lots of fun. Plus Matilda can use it for a long time after it is made. The Piggy Bank Crafting Kit looks really great. My niece would love it. My little niece, Florence would love the butterflies.. but to be honest I would probably have just as much fun, ha ha. It HAS to be the Sew your own owl cushion! I am always attracted to owl things. I like the lacing shoe, it would be really useful! The Lace and Tie Trainer. I have always done the cheating way of doing my laces so would be ideal for me to practice on as I have my own kids to teach and also I am a TA for Year 7’s and you would be surprised how many of them cannot do their own laces. The Colour Them In Fabric Butterflies because my little girl is obsessed in butterflies at the moment. The marbling kit to try out with my Brownie pack. Sew Your Own Owl Cushion, really cute and great way to start the kids off sewing! The Treasure Chest Crafting Kit would be right up my sons street, so he could keep all his little treasures in there….some pennies, an acorn, a feather and some marbles! Bird House and Treasure Chest Crafting Kit – Creative * will encourage wildlife! as a guide leader I love all the crafts for guides , but love the owl cushion for me! Well you said Products ,So i have chosen 3 i like for different reasons. !,Colour them in fabric Butterflies,I thing every little girls loves things with butterflies they can let there imagination go wild with colour.2,Treasure Chest crafting kit.I has a child & an adult love boxes of all shapes & sizes,So feel any child would love this & it’s got a crafting set too.3.Piggy Bank crafting set.I think when they have painted this little pig they will want to us it,So encouraging them to save which can only be a good thing. I love the tie and lace trainer as we are trying to teach my little one how to thread and maybe move up to lace shoes. My little niece is obsessed with boxes! So one of the paint your own box kits, either the treasure chest or the wee bird house. Or jewerley box! The marbling crafting kit is really nice, I like that you can grow sunflowers too, a very nice idea. I like the Bird House and Treasure Chest Crafting Kit. Both items are useful once decorated. The marbling kit or the fabric butterflies look fun. Ooh, the piggy bank kit would be cool. Save your pennies! The Sew Your Own Owl Cushion looks great! owl cushion, my daughter loves owls! Wow! What brilliant craft ideas! I absolutely love the Bird House and Treasure Chest Crafting Kit. I love crafting with my grandchildren and this kit looks such fun. Great site. Pirates never seem to lose their popularity. the Bird House and Treasure Chest Crafting Kit – it looks lots of fun! Marbling craft kit looks interesting. The Marbling kit looks great fun! My granddaughter would love having a go at the Marbling Crafting Kit. Loving the little Sew Your Own Owl Cushion, such a cutie and looks like fun to make. My nephew is obsessed with pirates at the minute so he would love the Treasure Chest Crafting Kit. I love all the kits, but as myself and my daughter love owls it would have to be the Sew Your Own Owl Cushion! OO=ops,my grand-daughter got a little carried away and submitted the comment without any comment.She liked the sew your own owl cushion as it is so cute and she thinks it’s something she can do without any help.We’re at this fiercely independent stage ! I love the Make Your Own Mask set – my son would enjoy this but so would I, for Fancy Dress parties! My Grandson would love the Treasure Chest Crafting Kit. I’d choose the Make Your Own Friendship Bracelets, as my daughter and I would enjoy making them together. I like Sew Your Own Owl Cushion, I think the little ones will like this & they can do it bit by bit. I like the Lace and tie trainer – so useful. Love the paint your own Piggy bank kit. I love the Marbling craft kit. I have done marbling with children before and they always love doing it. Love the Treasure Chest kit. Make Your Own Friendship Bracelets would be my choice. I love the sew your own owl cushion! I really love the Treasure Chest Casting Kit – Treasure hunts have been passed down by the generations in our family and are as still popular to the current day as they were 50 years back so this would be ideal for us! I like the marbling craft kit. My boys would love the treasure chest kit! The kids love badges, so the make your own button badges kit would go down well! My daughter’s nearly 3, and there are lots of possible birthday ideas. The lacing shoes could be nice, and I think she might be willing to give the owl sewing a try with some help. I like the lace and tie trainer. Very useful since most kids shoes have Velcro nowadays. the piggy bank kit is fab! may help my boys to save a few pennies too! I really like the sew your own owl cushion and the colour them in fabric butterflies! My girls would love those kits!